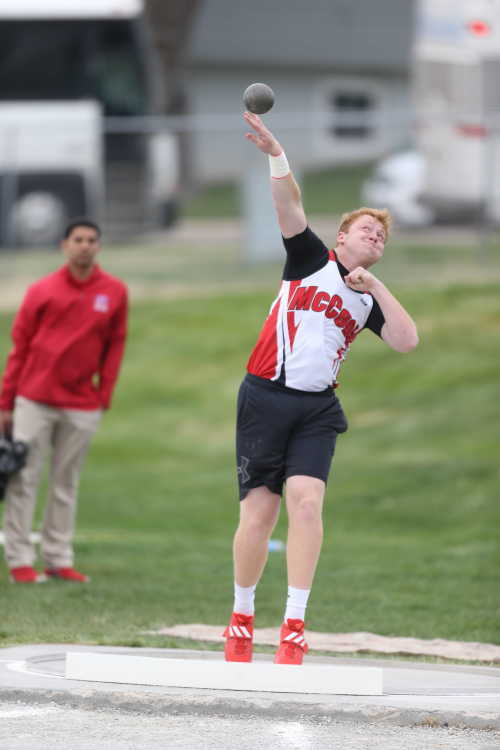 McCook junior DJ Gross (below) unleashed his shot put throw of 53’8 1/2” that won the GNAC championship meet on Thursday in McCook. Gross finished six inches beyond top challenger Tyler Tracy from Class A Kearney. Gross also launched the discus his career-best 162’7". McCOOK, Neb. — Team scores, all champions and top eight McCook Bison placers in the GNAC championship meet on Thursday. Teams: 1. Kearney 155, 2. McCook 107, 3. Lexington 57, 4. Scottsbluff 49, 5. Columbus 46, 6. North Platte 44, 7. Hastings 38, 8. Norfolk 31. Shot put: 1. DJ Gross, MC, 53’8 1/2”; 2. T. Tracy, KEAR, 53’2 1/2”; 5. Colin Giron, MC, 50’2 1/4”. Discus: 1. J. Larson, North Platte, 167’; 3. Gross, MC, 162’7” (PR); 5. Giron, MC, 157’ (PR). High jump: 1. C. McCracken, SCOT, 6’4”. Pole vault: 1. Landon Towne, MC, 14’4”; 2. M. Huebner, KEAR, 14’; 3. Joel Carter, MC, 14’ (PR); 4. Tyler Lytle, MC, 13’4” (PR). Long jump: 1. Morgan Fawver, MC, 22’1 1/2”; 2. C. Kitt, KEAR, 21’9”; 6. Bunger, MC, 21’1”. Triple jump: 1. A. Waikur, LEX, 46’7 1/2”; 2. Fawver, MC, 43’10”; 6. Dugger, MC, 42’11 3/4”. 100 meters: 1. 1. M. Maessner, KEAR, 10.8; 3. Alec Bunger, MC, 11.24; 7. Corban Jernigan, MC, 11.53. 110-hurdles: 1. N. Stoeckle, COL, 15.0. 200 meters: 1. Maessner, KEAR, 21.73. 300-hurdles: 1. B. Miller, KEAR, 40.84. 400 meters: 1. M. Koch, COL, 51.91. 800: 1. S. Simonson, HAST, 2:02.05; 2. Cameryn Berry, MC, 2:03.45; 6. Josh Huff, MC, 2:06.97. 1600: 1. J. McFadden, KEAR, 4:42.02; 8. TJ Renner, MC, 4:55.93. 3200: 1. J. Sutton, KEAR, 10:13.97; 4. Riley Mai, MC, 10:24.41. 400-relay: 1. Kearney 42.84; 2. McCook 44.01 (Jernigan-Bunger-Drew Harvie-Ethan Wilcox). 1600-relay: 1. McCook 3:32.62 (Isaac Hegwood-Seth Dugger-Ty Stevens-Cameryn Berry); 2. Hastings 3:34.43. 3200-relay: 1. Kearney 8:36.79; 2. McCook 8:37.2 (Renner-Hegwood-Huff-Hinze).